This OpenG Review is closed. See Summary Post here. Please start a new thread to discuss new changes to this VI. 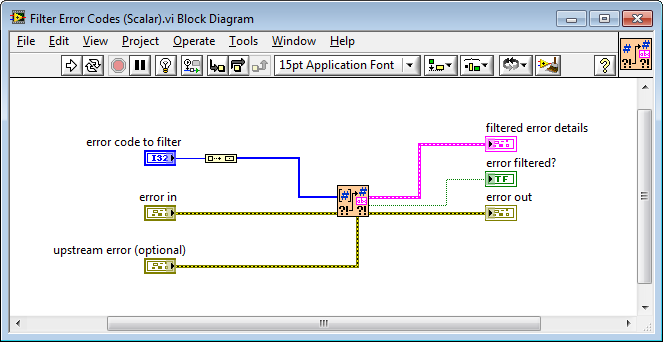 This VI has a integer (array), error code, as input and when the error code matches the error code on the error wire it supresses the error. 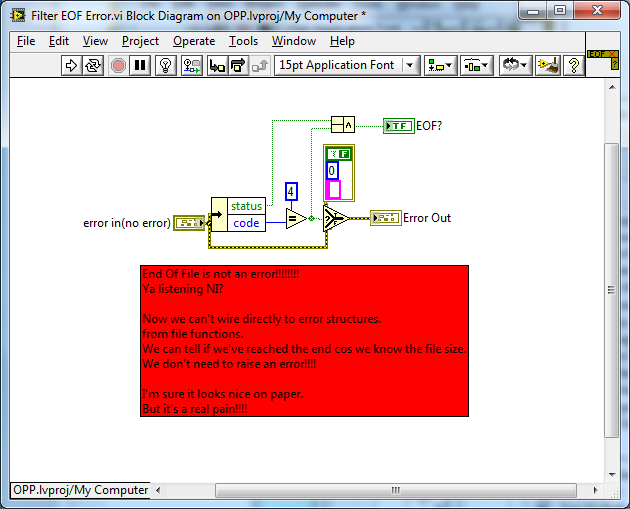 I use the Structured Error Handler Express VI when I want to supress specific errors. It has quite a bit of functionality. This idea on NI's Idea Exchange is similar. Hopefully, NI will add the SEH to the default pallets. Your post prompted me to submit this idea. I never created an array version (as never have the need) - not saying one wouldn't be useful. 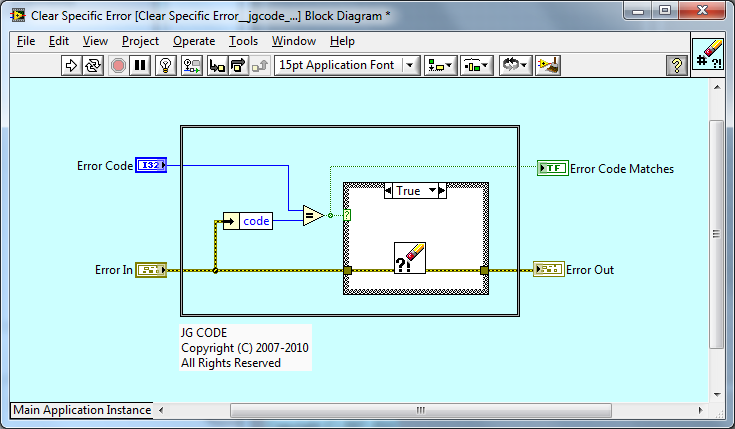 Code is in LabVIEW 2009. There is nothing special about the clear error. It is just a control and indicator unwired. These are my versions of the clear error and clear specific error (you can find them in many of my submissions to the CR) that uses far less realestate and can be placed between property nodes (and similar) without having to route wires around. I've had two versions of the array type. My first attempt uses a for loop. 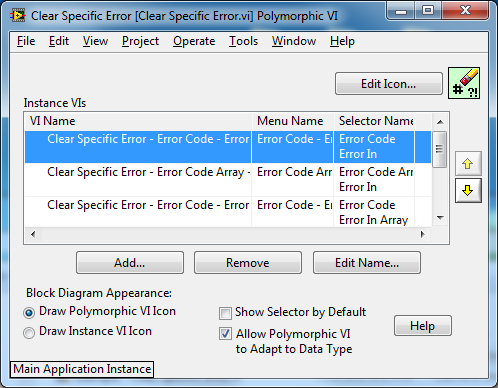 It has the added benefit/feature of inputting an empty array will remove all errors. My second attempt uses the Search 1D Array and check to see if the resulting index is greater than or equal to 0. This should be a little faster than comparing all of the array and OR the results. Similar to Shaun, I made the icons small so I can fit them between property nodes. I had a hunt as to aid the discussion. I could only find this in OPP from your LAVA CR files but I may have missed it? Your snippet obviously is missing your reuse subVIs - do you mind posting? Should we support an array of Errors In too? This would mean a total of 4 VIs - most likely with the Error In array as a thin wrapper around the above mentioned VIs (no function changes). I have made this into an OpenG Review. Only thought is that it's suppress. I just updated my second implementation from above to add a check for an empty array being passed in. 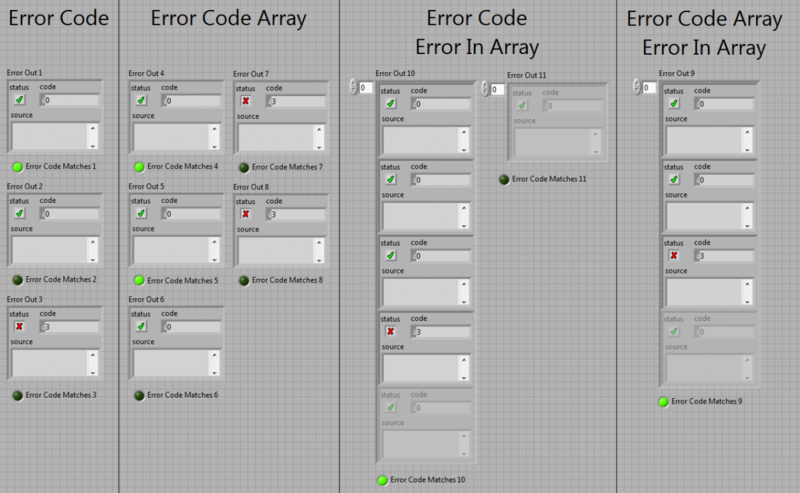 So now all errors will be cleared if the array is empty (which is currently the default). Is this a desired feature to clear all errors? I think we all agree on the functionality of the VIs which is good. 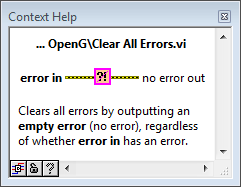 IMO: If you want to clear all errors then you should use the Clear Errors VI. If an empty Error Code Array is passed in, then it contains no Error Codes and therefore no Errors should be cleared? It seems to me even an inline VI size/shape would still get in the way of the outputs of the Property Nodes anyway? Looks good JG. I think we have left one discussion... what kind of icon should the VI have? One that is fits between property nodes or the one we have now? 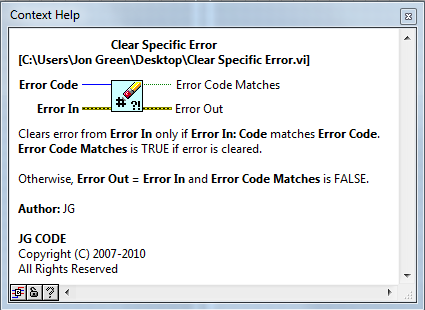 And I would change the label of "Error Code Matches" to "Error supressed? ", I find the first terminology pretty vague namely. I'm for the smaller icon personally. Since this VI is called "Clear Specific Error.vi", it should really be "Error Cleared?". For the error array VIs, would it make more sense for this indicator to be an array so the user can figure out which error was cleared? I'm onboard with everything here. Especially since NI's verbiage uses cleared, that's what users starting with OpenG might look for. I agree - I will change Error Code Matches to Error Cleared?. The depends - what are your use cases? Are you going need that information to go back through the array and index out that cleared error or make a decision based on that error etc...? Or do you care that an Error was cleared in the Error Array you passed in? That information is there - you could wrap the Core VI in your own For Loop if needed, it guess its a question of what is the main use case. We currently have two inputs and two outputs, and 4x2x2x4 allows for future expand-ability (not a requirement but a nice to have as we have other methods for dealing with this). An inline VI size/shape would still get in the way of the outputs of the Property Nodes anyway (from the above images posted)? If anyone can provide a list of pros/cons for the smaller icon, please do. 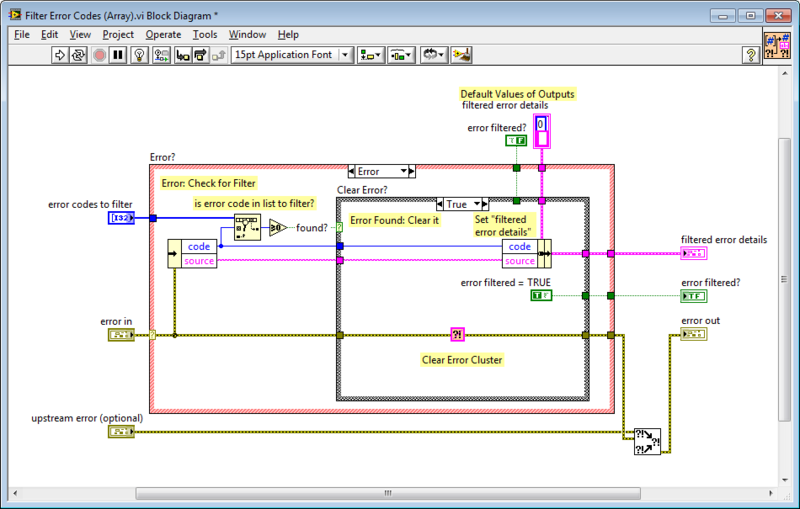 The first VI is called Filter Error Codes and filters either a scalar or array of integer error codes. It also returns the information about the error that was filtered, which is useful for handling that error. And, here's what the scalar implementation looks like -- you can see it just calls the array implementation. Quick design question - why pass out and maintain a new data-type (which is a subset of Error cluster) when an Error cluster could just be passed out? Great question! We actually had a long debate about this at JKI, back when this function was designed. most of the time (e.g. 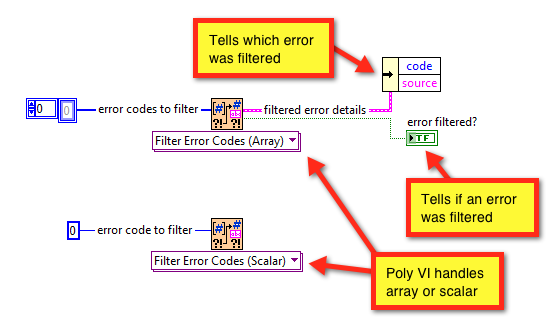 the scalar error code to filter use case) you only care about the Boolean output error filtered? (e.g. wiring it up to a Case Structure's case selector or similar) so we decided to make that raw Boolean an output of the VI, rather than requiring the user to unbundle it from the filtered error details. in the case where you want more information about the filtered error (like if you passed in an array of error codes to filter and need to know which one occurred), then you can unbundle the code or source string from the filtered error details cluster. We didn't include the Boolean error filtered? in the filtered error details cluster since that would be redundant (the Boolean is already an output of the VI). And, if we did actually add the Boolean error filtered? to the filtered error details cluster, then it would look a lot like an error cluster and we would then probably want to name the Boolean status (since that's what it's called in a normal error cluster), which does not convey the intent nearly as well as calling it error filtered?. 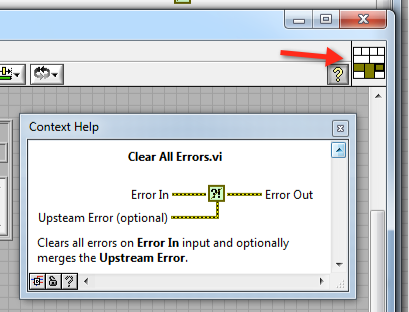 What is exactly the functionality/use of the 'upstream error'? It e.g. allows you to check for an error from a specific task, handle it (e.g. clear it) whilst persisting error information from previous code (upstream). Normally I would merge this external to the VI, but I like the fact that the merge is included in the VI (one less thing to do). That's right. It's a real space saver to not have to merge errors as a separate function call. And, this is a standard that I hope can be adopted, if others agree that it makes sense. 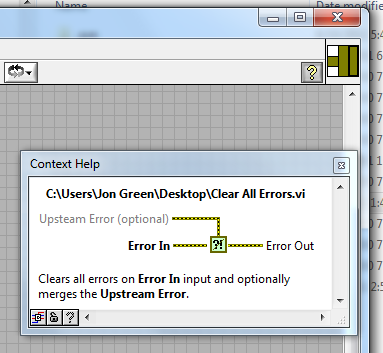 Note: I think we should add this "upstream error" to the "Clear All Errors" function, too. Shows the Upstream coming in from the top in context help (although you can wire it from the bottom). (Note: Upstream will actually be optional, I was just playing around with the CP). What are peoples thoughts on the VIs that Jim has donated? Personally aside from the Upstream Error feature, I like that the core VI is the Array and the Scalar is the wrapper so there is only really one lot of code to maintain. Another question following on from my previous ones - there is enough CP outputs to output all three cluster elements separately (as opposed to the boolean and new cluster) - was there a specific reason not to do this? Can anyone help with the Connector Pane (note: Upstream will actually be optional, I was just playing around with the CP). Here's a conpane that gets one step (another pixel or two) closer. One comment that I want to make, that's actually a case for note adding an Upstream Error, is that it's possible to easily misswire the Error in (error to be cleared) and the Upstream Error. And, if misswired, the result is exactly the opposite of what users would intend -- that would lead to quite an insidious bug. However, Error In (error to be cleared) should probably be made a Required Input, which would certainly help users identify if they accidentally misswired in a way that left Error In (error to be cleared) unwired. However, Error In (error to be cleared) should probably be made a Required Input, which would certainly help users identify if they accidentally misswired in a way that left Error In (error to be cleared) unwired. 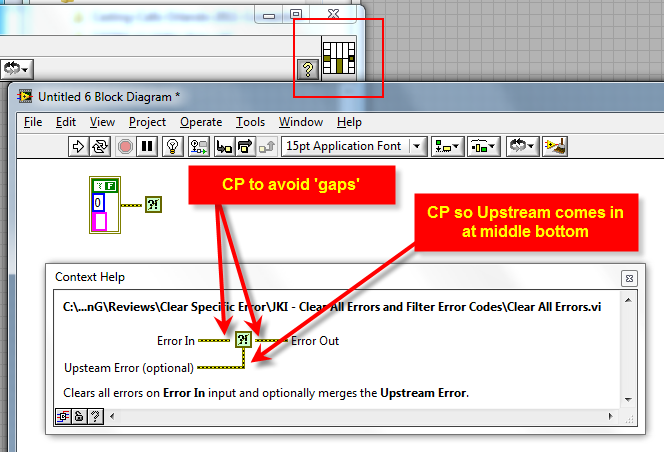 Or we could leave it out (no Upstream Error as per the example you posted)? 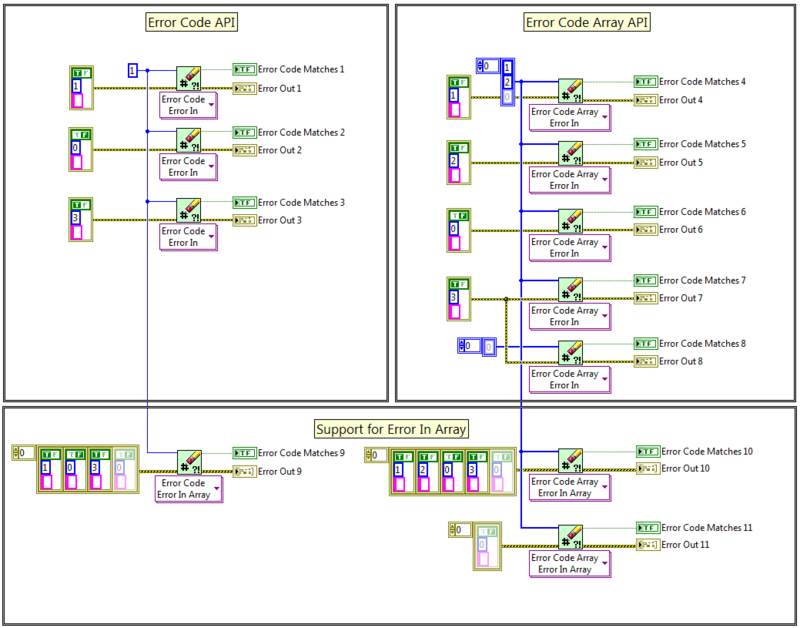 The pitty is that in almost every instance where I use Clear All Errors, I use Merge Errors to merge in upstream errors. So, I think it's a really useful design pattern. My vote would be to make the Error In a required input.